Today’s story joins hands with Lakshmi’s request (made sometime in October last year!) to narrate how alert, attentive, observant and aware I am of my activites in the kitchen when burning cooking food and maybe you could learn a few tricks of the trade from a true professional by the end of this saga. When I first started cooking as a student, I could count the number of times I had cooked during the month by just looking at my hands….by the number of burn marks or cuts. It was inevitable and I had one everytime I cooked. For the absent-minded person that I am, it amazes me that I have not encountered any major kitchen disaster like hot oil spills or pressure cooker bursting (this happened to my mother once and she escaped without a scratch) Yet! Small ones do keep happening every now and then. Back in school days, one episode stands out. My roommates and I had invited a bunch of seniors for dinner that day. I came up with the idea of making masala dosa with chutney and sambhar. Sounded great, but dosa was an unknown territory for all of us. I picked up the samaithu paar book(the only cookbook in the cabinet) and hurriedly looked for dosai. Rice and Udad dal…how difficult can that be? We also had a blender now. The soaking time said ‘overnight’ and we had just about 4-5 hours. We could soak the rice and dal, go grocery shopping, make the chutney and sambhar and then grind the dosa batter. That should be enough time I thought. Then a brilliant idea struck yours truly. I boiled water in a huge pot, switched off the flame, added 18 cups of raw rice into it and covered it with a lid. Ah there! That ought to speed up the soaking process. Off we went to the store to buy huge bags of potatoes and onions for the masala filling. At the back of my mind, I could not help feeling pleased and proud of myself. ‘Next time,’ I said to myself ‘when I talk to amma, I have give her this handy tip!’. 2 hours later. My roomies had their hands full preparing the accompaniments and I opened the lid to see how well the rice was soaked. Horror of horrors! Half cooked rice had filled up to the brim, looking for space to grow even more! Now what? N was quick to recover. She ran to the Indian store to get Dosa mix and saved the day. I learnt my lesson that day. I stick to what the elders and cookbooks say with traditional recipes and never try anything new when I have guests over. BTW, we managed to finish the rice over the next week and also successfully made dosais the following week. Take 2 teaspoons of oil and fry the chana dal to golden brown and then add the onions once the onions become transparent add the tomatoes and the chillies and fry them all till soft and done. Then cool them and add salt and grind them into a fine paste in the mixie and season with mustard seeds and curry leaves. Heat up 2 tsp of oil and add mustard seeds, red chilli, udad and chana dal. Once the dals brown add onion and cook. Then add rest of the ingredients and cook until the tomatoes are soft and cooked. Grind everything with little water with required amount of salt. YUM! Yeah, you don’t know how many times I have dodged the falling knives off of the counter. I have jumped a lot!! Hahaha!! My mint all frozen right now, got to plant some more shortly. Hi Bigs! Falling knives sounds scary! never done that yet:) Chutney tastes great with idli too. Chutney looks good and sounds like a sure fire winner combo with dosa. Hema!! !this chutney is something very new to me but i am definitely going to try as it looks so yum!! This one will go great with white rice and chapati …..awesome one !!! haha… you should ask (lesser mortals) about cooking disasters..
Chutney recipe noted for dosas tomorrow ! Its is quite a combination with dosa/idli. DO try it. We were quite an army ourselves;) Let me know how you liked it! Chutney looks so good. I am going to make it. Thank you for posting. 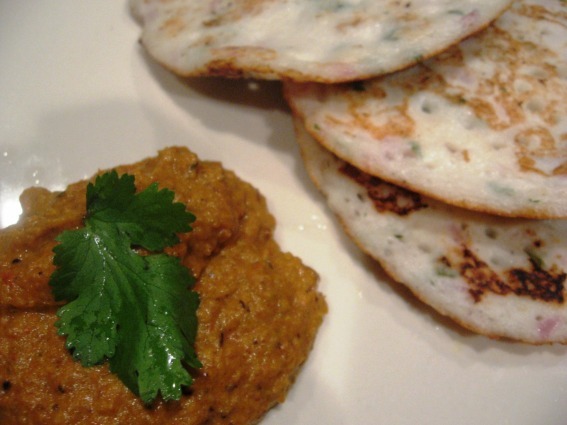 I just discovered your blog, while searching out recipes from south India. I’m very happy to see that I don’t have to look any further. I may, from time to time, ask if you can explain something to me. I’m vegetarian, have always loved Indian food, and a neophyte regarding south Indian cooking. I prepare in the same way for idlis.Looks delicious. Pics look awesome. Love your recipe and it looks absolutely delicious. The chutney looks really delicious! Just curious as to what makes it ‘chettinaad’? LOL. Half-boiled rice filled to the brim and looking for more space to grow. HAHAHAHAHAHAHAHAHAHAHAHAHAHA!!! You are SO FUNNY, Hema! LOL. hello! I’m enamoured of your blog but I am disappointed you haven’t provided for a subscription to your mails everyday from your recipe blog.Is it possible you can do so. I simply love your recipes and would love to receive your recipes through mail everyday.Hope it will be possible.Thanks and best regards-Prema. Hi Hema, love ur recipes! u mentioned u’re in FL…if you don’t mind me asking where exactly in FL are u based? Sounds spicy and yummy>Great job!! It’s a boring day at work and I decided to look for a nice recipe that I can go home and cook. Found this interesting blog of yours. More than the recipes what captured my interest was they way you wrote! I went ahead and read all of the posts. Very interesting. Specially theone where you mentioned…..the day you landed in US and you cooking adventures with roomies…made me nostalgic. It was like been there done that moment:) I could totally relate myself with you. Approaching 30, 2 yr old daughter – mine is 1yr though…….well I tried teh chettina chutney and it came out very well. Passed on that to my mom too. Kepp blogging! Recipe looks amazing – I’ll ask my wife to cook it ASAP. I tried the 2nd recipe today and it was absolutely delicious. Thanks for posting a healthy and simple recipe. the curry looks delicious. As far as the ingredients are concerned I always have a hard time to find up here. but thanks to my friend john miller who introduced me to a great resource and i thought that i pass great along as well. Your presentation of the recipe along is simple and easy. Measurements provided in ingredients is perfect. I tried it and works great.